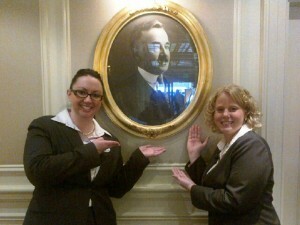 I had the distinct pleasure of being a guest this past weekend at The Hotel Hershey. It is one of America's landmark hotels, a Four Star and Four Diamond rated resort and a member of Historic Hotels of America. No, I haven't changed the focus of my posts to travel - though it's tempting. "We want your stay to be wonderful so you should let us know if there is anything at all you need or that we can do so that it is," the woman with the nice smile said in such a way that I felt she truly cared. "How would you like to begin your stay, with milk or dark chocolate?" she asked. Her eyes grew big like saucers in anticipation of my answer. "I would like dark please," I said. "Oh, that's an excellent choice!" she replied - like it was the very first time she had heard that answer as she handed me a full-size Hershey's Special Dark bar (that I'm eating as I write this post). A uniformed woman approached me at the welcome reception with a tray of appetizers, told me how delicious the food is at the resort and I should try one. She sounded like she meant it. Her name badge said 27 years of service. She seemed so comfortable and at home, I asked what she thought of those 27 years. Immediately, her eyes lit up and her lips curved into a pleasant smile. She told me she didn't really need to work, her husband was a business owner, but she had wanted something part-time to do that allowed her to leave her work at the job when the apron came off. And she never left because she was so happy there. After all these years she had so many friends there and everyday was a new experience - she often thought she should retire but couldn't bring herself to leave. She told me many of the staff had been there for a very long time and felt the same. "Is there anything I can do to make your dinner more enjoyable?" asked the Dining Specialist. Her title was probably Waitress but clearly someone who exhibits that level of care deserves acknowledgement of expertise in her title. In fact, the team in the dining room inspired me to show my appreciation through a substantial capital reward, aka tip. Watching them work with patience, genuine interest and expertise together made my meal more enjoyable. Seriously. Constance knew all about the chocolate diamonds in the jewelry store and invited me to ask her any questions at all because she loved to tell the story. When a child entered and unwrapped a Hershey Kiss (they are everywhere for the taking) Constance asked the little girl if she could please have the wrapper so she could throw it away for her. Every single employee of The Hershey Hotel made an effort to acknowledge and care for my comfort in a way that was never annoying or seemingly artificial - andenhancedmy experience, as much as any of the otherluxuriousaccoutermentsthe resort has to offer. They do this with an average of 6,000,000 people every year - and there is novisiblesign of burnout. How often can you walk away from a business or service and say that the staff made the experience in such a memorable way? You may learn a valuable customer service lesson or two reading this if that's the perspective you have. Or, you may learn an HR lesson on recruitment and employee relations - understand that employees cannot possibly be this happy and tenured without an organization and management that respects and values them, and shows appreciation and cares an incredible amount. As a CEO, you might learn that Milton Hershey came from a very humble family of little means, who grew a town and an empire reaching the four corners of the world, through a culture of ethical leadership and philanthropy. The walls of The Hershey Hotel are lined with photos of the man with his staff, with his sleeves rolled up, with a smile on his face. While building the hotel, an engineer toured Hershey and proudly told him that the backhoes could do the work of 40 men. "Then get rid of them and put 40 men to work," Hershey said. P.S. At checkout, I asked the Receptionists if I could take their photo for a blog post on my experience. "Can we take it with Mr. Hershey?" was the response I received with smiles.